Shalom! Wasn’t sure I would get another update done before I leave on Sunday but I got up early this morning so that I could. I hope you appreciate me sacrificing my sleep! Actually, classes ended yesterday so getting up early was actually an hour later than usual. Yesterday was the last day of classes and it was a sad day. I have made so many new friends and acquaintances and have really enjoyed my time at the Conservative Yeshiva and it was hard to think that this was it. Contact information was exchanged and I plan to stay in touch with a few people but it was still sad. It reminded me of summer camp – you spend all day with a group of people for a week or two or three and you really know them well and then you leave and it is really hard. I also want to correct something that I wrote in my last post about Liberty Bell Garden Park. I said it is dedicated to all the residents of Jerusalem and, while that is technically true, that isn’t what the dedication says (I read it again). The park is dedicated to “All the Children of Abraham”. This is nice because it reminds us that even if we are different religions now, we all began from one point and descend from one person and tradition. I have to say that I have been a bit surprised by how many Arabs are part of the regular Israeli world here in Jerusalem. With all the news and stories about the Second Intifada and restrictions on Palestinians, you lose sight of the fact that there are Arabs who are Israeli citizens and part of the regular population and community. Everywhere I go I see Arab women in headdress and Arab men are taxi drivers or work in the shops. Not just this park but at other events as well. Rachel and I went to the Arab Shuk in the Old City last Friday and it was really strange to me to see Arabs selling Judaica and Christian items, though there are Arab Christians. I would love to have talked to one of them about how they felt about this but I am sure that the answer would have been “it’s good business”. The shuk was very interesting. It is one long crowded corridor that is covered. There is a walkway down the middle that is about as wide as a city sidewalk and slanted downward at a pretty good pitch. There are markets stalls on both sides that range from tiny to quite large and cavernous. In addition to religious items, you can buy just about any kind of souvenir of Jerusalem and Israel you could imagine, food, shoes, clothing, jewelry, fabric and many other things. Haggling is expected and I am not good at that. Rachel haggled for me when I bought a pair of shoes but I should have gotten the price down more. I figured I was paying less than they would be at home so I was fine with what he wanted. The merchants are mostly very nice and the shoe guy asked if I wanted a cup of tea or coffee after I had purchased my shoes and encouraged me to look in his brother’s shop as well. But, some were a bit creepy and didn’t want to take no for an answer. 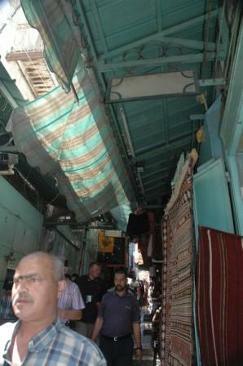 At a corner in the shuk, one of the few places wider than about 5 feet, we saw two fully armed Israeli soldiers. Not sure what good they would be if there was a problem because it was impossible to move against the flow – the one time I tried to back track I felt like a salmon swimming upstream. We went from the Shuk to the Kotel (Western Wall) and were amazed at how close they are to each other. It was Friday afternoon and there Kotel Plaza was quite full. It was very hot once we were back out into the sun and we didn’t stay too long and decided to spend the next few hours in the cool of a movie theater. Seeing an English film in Israel was interesting. It was still in English but with Hebrew subtitles and the voice track was not very loud – not sure if that was on purpose or the result of poor equipment. We were surprised to learn that they have an intermission in every film here. Friday evening we (Rachel, Elhanan (from Holland) and his partner Natan and Scott) went to services at Kol HaNeshema, a Reform congregation here that has a slightly New Agey feel to it. I felt that the services were too American and too Reform for me, despite them being entirely in Hebrew including the sermon and announcements. When I told Rabbi Barry Schlesinger, the head of the Masorti (Conservative) Movement here in Israel that I went there he said he had never “breathed with Levi Kalman” (that’s the Rabbi’s name). I thought that was an apt description of the end of the service in particular. After services, we walked to the Mount Zion Hotel where we had reservations for Shabbat dinner. This was a very nice buffet and the food was quite good. When we got there, we were the first ones in the room and it was nice and quiet as we sang Shalom Aleichem and Kiddush. Just as we were starting to eat, this huge group came in (actually several groups but one large one in particular). This group was Mizrahi (Jews from Arab lands) and was celebrating a wedding. You would have thought that we were intruding in their home. They kept shushing everyone when they wanted to sing or do a prayer, one man spoke for about 25 minutes and after they ate, they began to sing VERY loudly. Many people hurried through their meals and left. Rachel was enjoying the singing but the rest of us were a bit frustrated that we couldn’t hear ourselves talking. Elhanan and Scott found a nice quiet balcony with a beautiful view a few floors down in the hotel and we went and sat there and talked. One afternoon last week I skipped my classes and went shopping and sightseeing. Steve had seen Sarah Levy and they had decided that I was stressed out and needed to quit being so serious about the classes and do something fun. Sarah emailed me this and I was easily persuaded. I did tell her that she was getting half the bill for the shopping though since it was her idea! 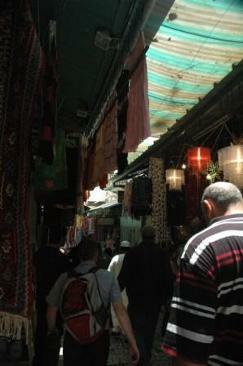 I went to Ben Yehuda Street which has great shops and people watching as well. I had a really unique experience while I was there. I went into a gift shop where everything was marked as 50% off. The owner, a very sweet older man who was very anxious, came over and started telling me prices for things that were less than half at times. He was very eager to sell things. After some other customers left he began to tell me that he had a huge bank overdraft and needed to pay it off as soon as possible or he would have to close his shop. A beautiful tray hand painted and designed by Emanuel (an Israeli artist that Steve and I both really like) caught my eye and I asked to see it. It was marked at 960 shekels (divide by 4.25 for dollars). He first halved it and then went lower. He stopped at 360 shekels. I really loved it but it was heavy and I also didn’t have enough shekels on me and he had already indicated that the price would change if I wanted to charge it. I agreed that I did want to buy it and told him that I did not have enough cash. He proceeded to wrap it up and told me to give him what I had and to come back later with the rest! I couldn’t believe this. He told me that he trusted me entirely, and that as a Jew trusting people was what he did, even if it had caused him problems! I gave him 100 shekels and, despite him saying that tomorrow as fine, I went directly to the nearest CASPOMAT (that is Hebrew for cash machine) and got out more money so I could go pay him. He was so happy to see me back so quickly and very effusive in his thanks. I went back into his store this Wednesday evening and he was very happy to see me back and glad to see I brought friends. I found some lovely things in another store – but I can’t say what as one of them is Steve’s present! In my Ulpan (Hebrew class) we always talk for the first 45 minutes or so about a variety of topics. It is good practice to both talk and to listen to others and see if you understand. One day Mihal had us talk about why all Jews don’t move to Israel. She is sure that there is room here and wondered why other Jews, particularly those, like us, who apparently felt a connection to Israel, didn’t move there permanently. It was interesting to hear the variety of reactions and reasons given. A couple of people felt strongly that it was not safe for all Jews to be in one place – an easy target for those who hate us. Others gave religious reasons – Israel as the land of all Jews is a decision and action that is meant to be God’s to make and achieve. Some gave practical reasons – my family wouldn’t come, I have a good job, I couldn’t stand the weather. In addition, some gave religious/political reasons – the Orthodox run everything religious here and that would cause me problems due to my status as a Jew, my feelings about them etc. It was a very heated discussion with lots of different views presented, attacked and defended. Interestingly, after making us all feel bad for not wanting to make Aliyah (move to Israel), Mihal then said that if she had a job offer in the US she would move there – but that would be ok because she is Israeli. It is interesting the mindset here that being Israeli is enough and no other Jewish activities are interests are needed. We talked about this some and she seemed to think that was fine – that all of life is Jewish here and you don’t need to go to synagogue to be a Jew like you do in other places. The same day that we discussed this in Ulpan we had a speaker for the Legacy Heritage Fellows, Debbie Weissman, who spoke about connection to the land, the difficulty of being Jews with power and the responsibility of Jews from other places to keep up to date with what was going on in Israel and to assert our influence. It was a great talk. Afterwards one young man, from Portugal, said he didn’t think Jews who lived outside of Israel had any right to comment on what Israel did and he also didn’t think that Jews who were new to Israel had any right either! He pretty much felt that unless you were born in Israel you should mind your own business. This view is particularly funny in light of the fact that most of the people in power in Israel were born elsewhere. Debbie told him that she could not possibly agree with that view and neither would most Israelis. We had a speaker the day before this who had talked about the evolution of relations between US Jews and Israel and she said that part of the problem is that Jews in the US don’t necessarily feel that they are in Galut (exile from Israel) as their lives are pretty good and they can visit as they please. I know this to be true particularly of Jews in New York City, some of whom expressed their sympathy to me for living in Galut from New York! I guess I should wrap up – as you can see I have been very busy. This week I read Torah on Monday and Thursday at the minyan at the Yeshiva. I have also led services several more times. Thursday I observed Evelyne’s (Steve’s mom) yahrzeit (anniversary of her death) by having a blessing at the Torah and also reciting a special prayer, El Malei Rachamim (God full of compassion) that is said to ask for peace for those who have passed on. It was a nice way to finish the program, as I am sure Evelyne would have been thrilled that I was there. Today Rachel and I are going to the Old City again and I hope to see the Burnt House Museum – remains of a house from the destruction of the Jerusalem in 70 CE (AD). Not sure what we are doing for dinner but we are supposed to have lunch tomorrow at Elhanan and Natan’s place. Going to try out a new synagogue this evening as well. I will post again once I am home, and tell you about the great tiyul (walk) that I went on with my Ulpan class around Jerusalem and will also get many many pictures up online then as well. Be well.